While falling into bed at the end of a long day can feel like a luxury, medical research shows it’s more of a necessity instead. At a cellular level, our bodies rely on sleep to repair and replace crucial tissues, fight infection, and enable cognitive functions in our waking hours. Accordingly, sleep deprivation has been linked to a diverse array of troubling medical conditions, ranging from high blood pressure to sluggish reflexes and even depression. Despite these findings, many Americans accept the risks of exhaustion every day. In fact, more than 1 in 3 adults regularly go without the sleep they need. To explore just how valuable sleep is to Americans’ wellbeing, we scoured findings from academic journals and the Centers for Disease Control and Prevention to examine a possible correlation between sleep and afflictions. Charting the relationship between lack of sleep and a variety of illnesses, our findings reveal how integral our rest can be to living unhindered by ailments. Our results might just make you think twice before skipping your shut-eye and give you a new appreciation of all the ways sleep can keep you well. Read on to find out how America’s health hinges on solid slumber. Due to new scientific findings, our understanding of sleep has dramatically changed in recent decades. As part of our ever-expanding appreciation of sleep’s benefits, many academics have studied links between sleep issues and other common health problems. 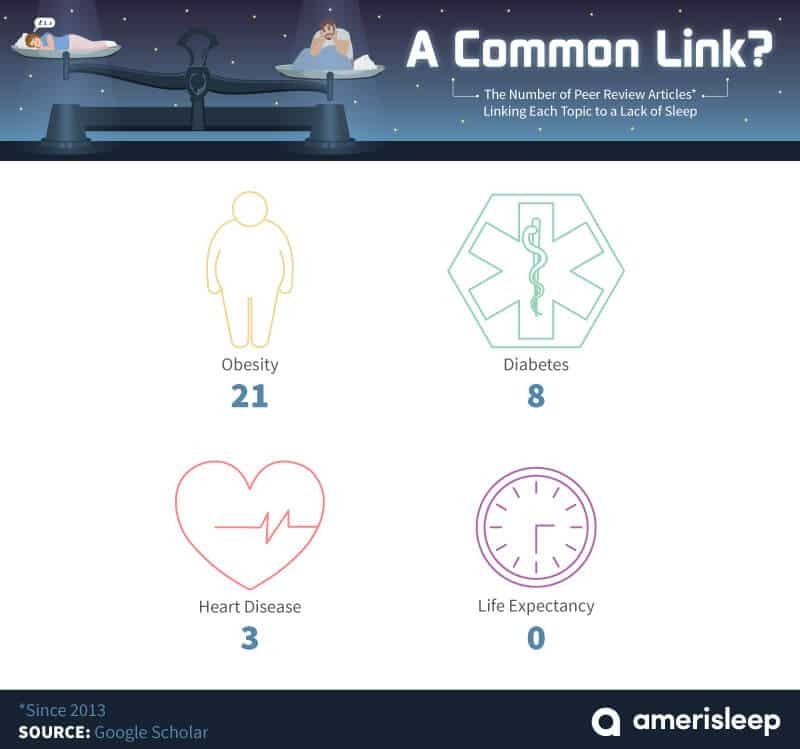 Of these, the most thoroughly researched connections seem to be that of sleep deficits and obesity. Our data showed no fewer than 21 peer-reviewed articles published since 2013 that pointed to a lack of sleep as a driving cause of life-threatening weight gain. Some scientists suggest going without good sleep leads to a hormonal imbalance, causing us to feel hungrier when we’re tired than we would otherwise. We also found a lot of recent research suggesting ties between diabetes and sleep deficiencies, including eight articles published since 2013. Three more recent articles also linked too little sleep to heart disease. We did not find any recent articles tying sleep deprivation to life expectancy, however. With this overview of the scientific literature in hand, we turned to CDC data documenting the prevalence of these health conditions by state to see if we could observe some correlations of our own. Using the CDC’s figures, we isolated states with the most severe obesity and sleep deficiency issues, as well as those in which the issues were least problematic. 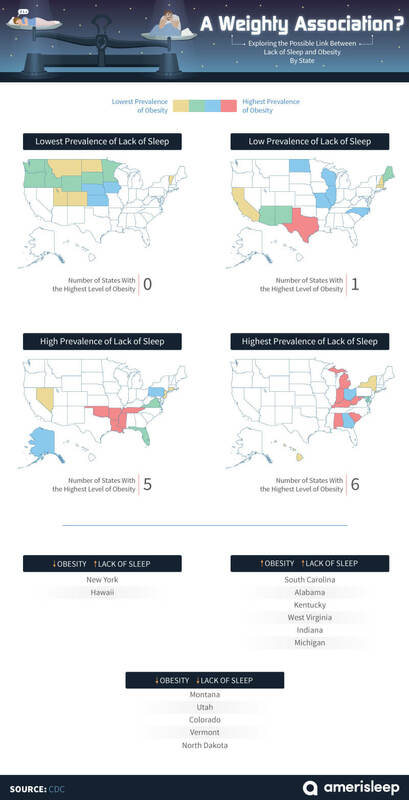 As one might expect given the research connecting sleep and weight issues, six states that earned the most severe obesity categorization also received the worst rating for sleep issues. The majority of these states were concentrated in the South (including Alabama, South Carolina, Kentucky, and West Virginia), although the Midwest also had two members of this doubly troubled group (Michigan and Indiana). By contrast, many of the states with low rates of sleep deficiency also boasted low obesity numbers. This contingent was primarily composed of states in the Mountain and Midwestern regions, although Vermont was also represented. New York represented an obvious outlier to these trends, however. While the state boasted relatively low obesity figures, its reputation for “never sleeping” seemed troublingly true. With diabetes, our geographical correlations continued, affirming the research tying the disease to sleep difficulties. In fact, in many of the same states where obesity and sleep deficits were both prevalent, diabetes was present at high rates as well. These patterns suggest the difficulty of determining causation precisely because obesity increases the risk for diabetes as well. Within this tangled web of symptoms, however, one observation is undeniable: Sleep deficits mirror these chronic illnesses closely in their geographical distribution. With diabetes, however, the converse link between good sleep and reduced rates of illness was not so apparent as with obesity. 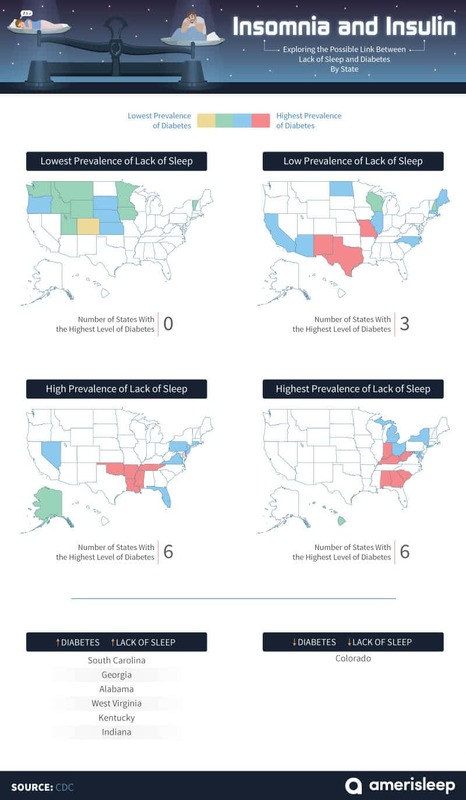 Colorado was the lone state with minimal levels of both sleep issues and diabetes present. Indeed, many of the states with the best sleep records had middling diabetes numbers. This perhaps suggests that while poor sleep can elevate diabetic risk, great sleep does not reduce it. With heart disease, however, the benefits of good sleep were indicated far more intensely. 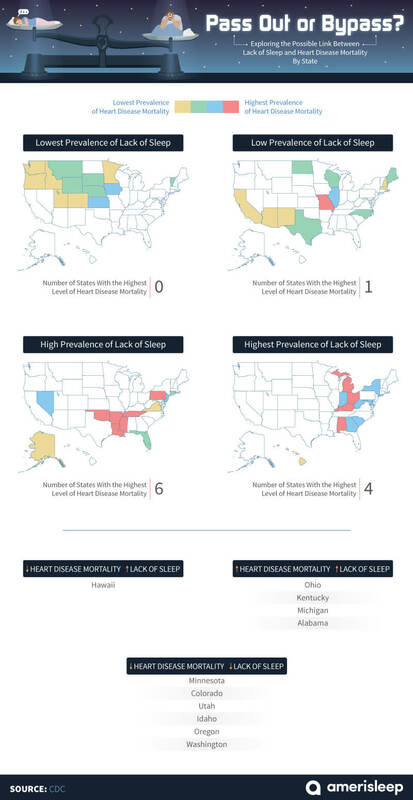 Six states qualified for both the lowest category of heart disease and lowest category of sleep issues. This healthy cohort was concentrated in the West, including states like Colorado, Utah, Idaho, Oregon, and Washington. Minnesota also appeared in this doubly blessed group, which may come as no surprise to those aware of the state’s enviable heart health record. According to the latest CDC figures, Minnesota boasts the lowest rate of heart disease mortality nationwide. On the other end of the spectrum, Kentucky, Michigan, and Alabama once again fell in the worst category for both health indicators. Ohio also earned this unfortunate dual designation for the first time in our study. Given our previous findings relating a lack of sleep to illness in many states, it should come as no surprise that life expectancy and rates of sleep problems were inversely correlated. This was particularly visible in the South, where states such as South Carolina, Georgia, Alabama, Kentucky, and West Virginia had high rates of sleep difficulty and low average life expectancies. New York, conversely, once again was apparently impervious to lacking sleep, boasting a high life expectancy despite its sleep issues. Western states such as Colorado, Utah, and Washington once again emerged as bastions of health, with excellent average lifetimes and minimal sleep issues. Minnesota represented the Midwest in this long-living, deep-sleeping group, while Vermont did the same for the Northeast. If anyone was inclined to dismiss our previous correlations, these findings present a powerful case for sleep’s essential power to sustain life. With these statistical relationships in mind, it’s hard to ignore the potential benefits of prioritizing sleep. 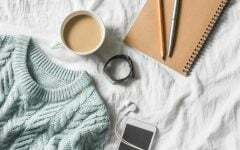 Often, we pass up on much-needed rest to accomplish our immediate objectives, find success at work, spend time with friends, or simply fit in another episode of the show we’re currently bingeing. But when it comes to health and happiness, curling up under the covers likely offers greater long-term benefits. Choose sleep more often, and our findings suggest you’ll be grateful you did so – and not just the next morning. If you’re ready to pursue the sleep your body needs, there’s no better sidekick on your quest than a mattress from Amerisleep. With models perfectly suited to any sleep preference, we’re experts in the realm of rest. By pairing the latest technology in memory foam with swift and simple delivery, our team makes improving your sleep our priority – so you can too. 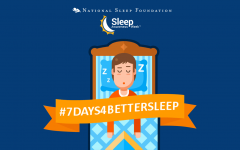 We utilized Google Scholar’s academic research platform to survey recent findings relating to sleep deficiencies and their potential health effects. 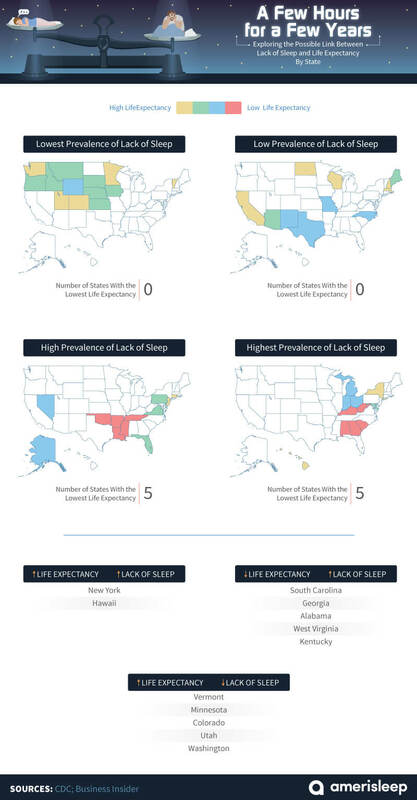 We then employed data from the CDC’s National Center for Health Statistics to correlate the prevalence of each health issue with sleep deficit statistics in each state. 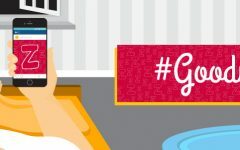 Want to spread the word about the wonderful effects of rest? 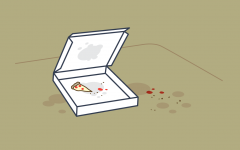 Feel free to share our findings and images with your audience for noncommercial purposes. 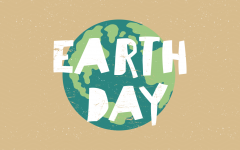 Please credit us appropriately with a link to this page – so you can rest easy knowing you’ve done the right thing.